No Sweat Winners | Faddegon's Nursery, Inc. 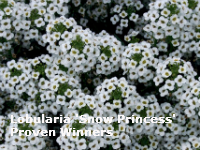 Snow Princess® Annual Alyssum (Lobularia hybrid) from Proven Winners. Produces drifts of white blooms throughout the season and doesn’t really care if it’s hot or cold out. In the heat of July, other plants may struggle, but not this one. Snow Princess billows upward to 8″ with a trailing habit of 24″ or more. 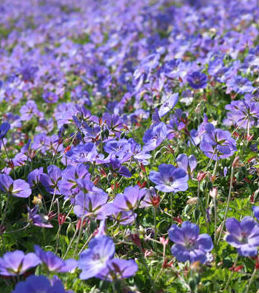 Use in beds, baskets or as a groundcover. Likes sun or part-sun. Winner of IPM Essen (Germany) Best Innovation Award, 2009. ‘Rozanne’ really needs a name change. Call her Reliable Rozanne. Staying compact and true to form is her forte, along with producing beautiful violet-blue flowers repeatedly throughout the season. One shearing in mid-summer will be appreciated by Rozanne, then she’s on her own until fall. Not many perennials can claim that! 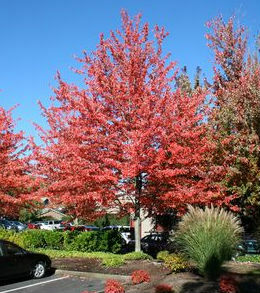 Rozanne’s leaves turn a beautiful bronzy red in the fall, so she’s still pretty to look at. She’s disease resistant, loves to naturalize an area, but is easy to contain if need be. Likes full sun to partial shade. Will not disappoint! 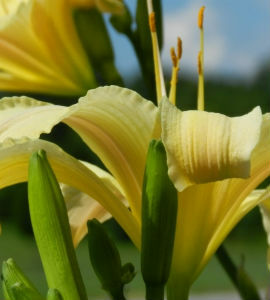 The reblooming lilies have the distinct advantage of charming us all season. Daylilies are supremely forgiving, doing fabulously with care, but not letting on if you’ve been ignoring them. They fill in quickly, so making a border or bed can be accomplished without using up much of your time or patience. ‘Happy Returns’ has ruffled edges and lemon yellow flowers. ‘Happy’ has some relatives too; ‘Rosy’ (ruffled edges, deep rose with yellow center), ‘Stephanie’ (ruffled edges, light pink flower with mauve, purple and yellow center), ‘Red Hot’ (ruffled edges, red with yellow center) and ‘Dynamite’ (ruffled edges, deep pink flower). Follow this link to take a look at some ‘Returns’. 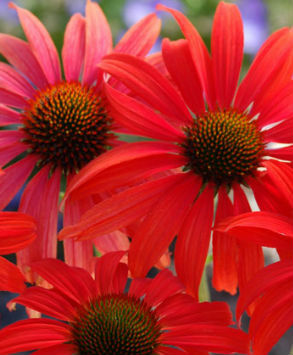 ‘Tomato Soup’ has proven itself to be a favorite coneflower. Coneflowers are generally sturdy, tall plants that have a real presence, signaling their no nonsense reliability and ease, along with a great spicy fragrance. Big flowers call attention to ‘Tomato Soup’, with centers so cool that they can almost compete with the petals in interest. Great for a sunny border or in a bed. Paniculatas have been prized in the United States since their introduction in 1829. This extremely hardy landscape tree or shrub boasts big oversized flowers in late summer when other flowering shrubs are done. Paniculatas enjoy a sunny location but can also tolerate a partly shady spot. The fast growing paniculatas bloom on the current year’s growth, so it usually blooms profusely despite deep freezes or a frost late in the season. 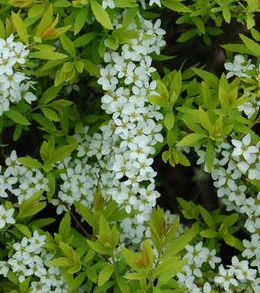 One of the most loved garden shrubs, Spirea is nothing if not graceful. Arching branches carry loads of blooms in spring, while the foliage is lovely year-round, turning orange and bronze in fall. The newer varieties get more and more exciting each year in terms of color choices. Height varies greatly with variety, so there are a lot of options for finding one that fits your needs. Prune after flowering if you want to shape it. The Maple Tree is the quintessential shade tree. Its beautiful green canopy of leaves shade you all summer and turn a brilliant orange or gold in the fall. It’s a traditional and easy choice for the Northeast where we’re known for fall foliage. Why go leaf-peeping when you could enjoy autumn colors every day? It may seem at first like an unexciting choice, but once you see the different varieties available (I’m thinking Japanese Maples too), you may feel differently. A profuse bloomer from early in the season right through frost. Scads of snapdragon shaped flowers burst forth on dense foliage. Mounding and trailing, torenia is well suited to hanging baskets, containers or beds. 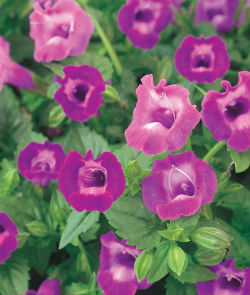 Torenia also comes in a variety of colors, so you can adapt it to any vision you many have. It’s nice to get this kind of color in the shade! 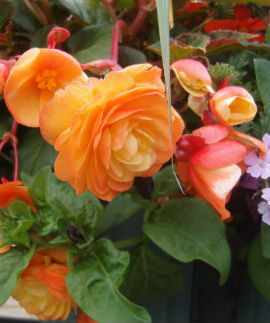 Also known as tuberous begonias, this is one of my personal favorites. Like most begonias, it does well in shade, blooming the entire season with huge fluffy flowers that come in a variety of colors. You will want to deadhead to keep the plant tidy, but isn’t it worth it for these big flowers? It doesn’t take long, they don’t pass quickly, so you’ll barely feel burdened by it. You may also want to take the tubers and store indoors before frost and use them again next year. You’ll notice each plant has two kinds of flower, male & female, which really adds to the visual interest of this stunner. Coleus seems to have gone through so many changes in recent years that it almost bears no resemblance to its original self. Forget bi-color foliage, some of these new varieties stagger the imagination with so many hues on one leaf. Combine that with leaf shapes from Dr. Seuss and you get a really fine looking plant. It’s not unusual to see someone filling a planter with coleus by itself. There’s almost no need for flowers! 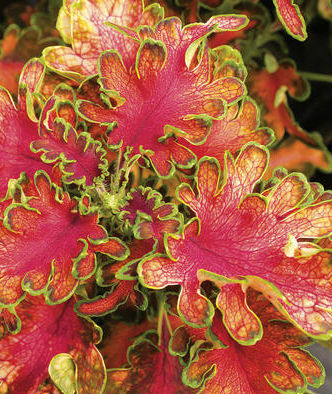 Coleus also combines beautifully with perennials or other annuals to give true dimensional color to your garden. Heucheras have taken the shade gardening world by storm in the last few years. 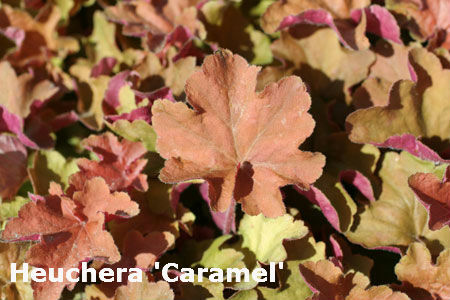 Also known as “Coral Bells”, heucheras are another plant that is mostly grown for its foliage, which comes in a staggering amount of variety. From lime green to almost black, side-by-side these plants may not even look like the same species! Lovely flowers dance above them in early to mid-summer depending on the variety. They also fill the same role as annual coleus by offsetting blooming perennials that come and go around them. You will really appreciate heucheras once you see them at work in your garden. A big plant with a lot of impact boasting showy plumes from June to July. 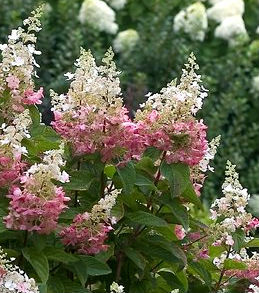 “False Spirea” comes in many colors, from white to deep red (‘Fanal’ being the most popular one), with shades of pink and lilac filling out the roster. 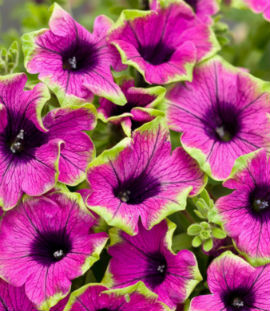 These flowers are great for a mass planting whether you use one color or several. 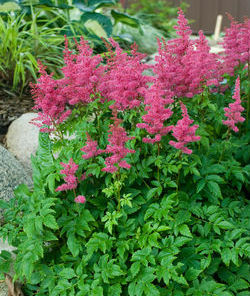 There are some differences in height as well, so the options are many for Astilbe. 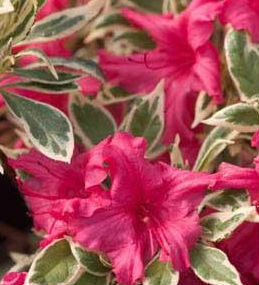 Traditional and pretty are Azaleas. They are fairly covered with flowers when they bloom in spring, so much so, that you may find it tough to find the leaves! After the flowers fade, very lovely foliage is left. A conifer that tolerates shade, Canadian Hemlocks don’t mind being out of the limelight. 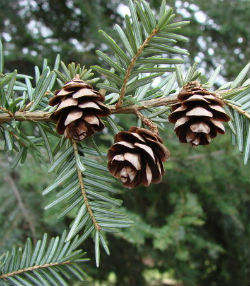 In a classic pyramidal shape, these trees can grow from 40′ to 70′ (although not a fast grower) making it a major landscape statement. They can tolerate sun as well, but is a great problem solver for a part sun location that needs a large barrier for privacy or just visual balance. And you get pinecones! Hopefully, this will give you a starting point for thinking about your outdoor spaces. 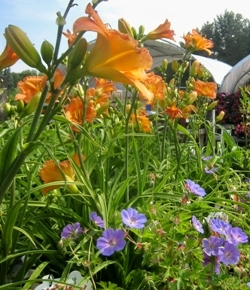 Don’t forget that we also have a lot of patio pots packed with annuals available during the season. Just pick up here and set down at home! Easy instant color.